The Cultural Dish: St. Joseph's Day and an Award! St. Joseph's Day and an Award! Today is March 19th, and for many Italian's, not only is it Father's Day, but it is also St. Joseph's Day (San Giuseppe). On St. Joseph's Day, many different foods, especially breads and cakes are prepared. 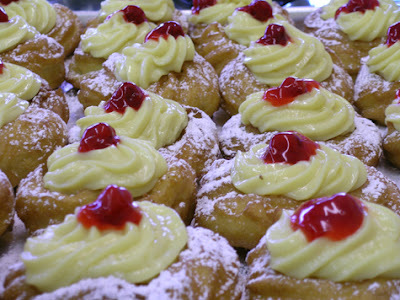 The St. Joseph's cake, called the Zeppole, is one of the many foods that are eaten on March 19th. (To learn more about the history of the Zeppole and St. Joseph, click here). Since it has been a busy week, I did not have time to make my own Zeppole, but I still made sure to buy some! These doughy, custard filled, treats are absolutely mouth-watering! 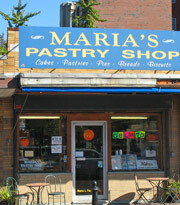 Although there are several Italian bakeries in and around the Boston area, my absolute favorite place to buy pastries, especially the Zeppole, is at Maria's Pastry Shop in Boston's North end. Although the Zeppole is quite popular and tasty, be forewarned that once March 19th comes to an end, so does the production of the Zeppole. So get out there and buy some - you will not be let down! Now, not only am I celebrating St. Joseph's Day, but I am also celebrating receiving another award! 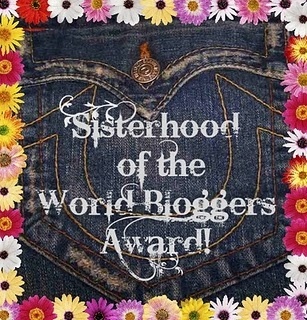 I want to send out a huge thank you to the Big Fat Baker for passing on to me the Sisterhood of the World Bloggers Award! As a recipient of this award, I am supposed to not only repeatedly thank Big Fat Baker for giving it to me, but I am supposed to share 7 things about myself and then pass the award on to 15 other bloggers that I have come to love! 1.) I love Harry Potter. And when I say love, I mean love! I plan on making an entire Harry Potter themed meal once part 2 of the last film is released. 2.) Although I own a cake business, I have never taken a cake decorating class. Everything I know was learned from family or self-taught. 3.) I cannot stand meatloaf. My boyfriend loves it and I hate it! For whatever reason, I got extremely sick from it when I was in second grade and have not been able to look at since. 4.) I really want to move and live in England! 5.) I worked on a research team and wrote a research paper in neuroscience that focused on brain makeup of persons with antisocial personality disorder compared to "normal" controls. Thanks again to Big Fat Baker! And don't forget to celebrate St. Joseph's Day with a tasty Zeppole! A happy St. Joseph's Day to you! I love Zeppole! Thanks a bunch!! I appreciate it. Have a wonderful day! Congrats on the award and thanks so much for giving one to me! I am really honored! I LOOOOVE harry potter, too. and i also think moving to england would be amazing. Congrats on the award! I love zeppole too! Congratulations on the award! I'm happy to find your blog. I didn't know it's Fathers Day in Italy today. You have lots of delicious recipes that I can't wait to try! Wow. Neuroscience research? Amazing and funny to hear the next number you weren't even keen :-) It's funny how things turn out! first time I heard about "Zeppole" was a few weeks ago, on a cooking tv show that we have here in Greece, and one of the competitors was an Italian girl that cooked "Zeppole" for dessert! And now I read about the yummy looking pastries again. Also, just got myself a deep frier, so this must be a 3 way sign that I have to try them myself! Thank you so much for the award! You're so sweet! (grazie San Giusseppe!) even if they're store bought. Adam went to college in Boston and remembers some of the most delicious pastries from the bakeries there not to mention his years in Italy. Wish you could send us some.. no good bakeries around here, sad to say. Congrats on the award ! You totally deserve it :) The post has some interesting piece of information! Those Zeppole look amazing. I would have loved to eat one of those on St. Joseph's Day!